Think back on your teenage years: Rough, right? Cliques. Self-doubt. Emotions gone haywire. Now imagine dealing with all that in the worlds of three Image Comics graphic novels slated for release in July: two separate high schools for the children of assassins and a survivalist camp where all the adults are dead. 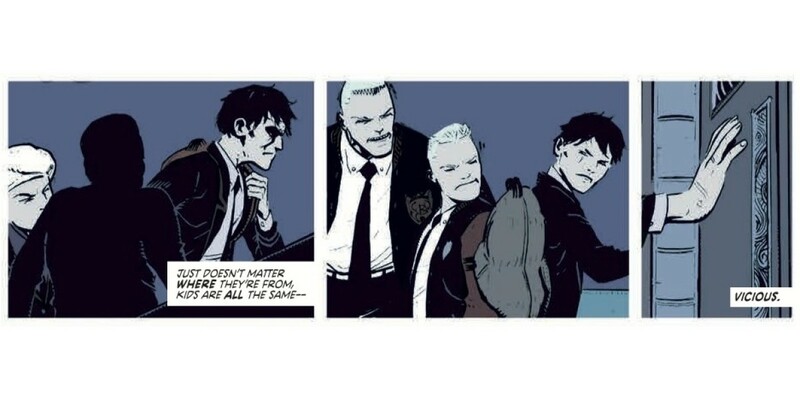 DEADLY CLASS VOLUME ONE: REAGAN YOUTH by Rick Remender, Wes Craig and Lee Loughridge is set in San Francisco at the tail end of the Reagan Era. It’s 1987, and Marcus Lopez is going to school with the children of some of the world’s most brutal assassins. Murder is an art. Killing is a craft. At King’s Dominion School for the Deadly Arts, the dagger in your back isn’t always metaphorical. If DEADLY CLASS sounds intriguing to you, but not quite right for a younger reader you have in mind, check out the teen-friendly FIVE WEAPONS by Jimmie Robinson. VOLUME TWO: TYLER’S REVENGE is the continuing story of Enrique, a boy from the lower rungs of society who gets into the illustrious School of Five Weapons by impersonating the scion of a famous family of assassins. While other dystopian works of fiction tend to be post-apocalyptic, SHELTERED by Ed Brisson, Johnnie Christmas and Shari Chankhamma is pre-apocalyptic, set in a survivalist camp, where people convinced that civilization is nearing collapse have brought their families. The series follows the dramatic events following one of the children’s plot to kill all the adults to make sure the children are the ones who survive the coming apocalypse. SHELTERED: VOLUME TWO sees the kids trying to rebuild after the trauma of losing their families, only for a new threat to close in on them. Interested in more teenage dystopias? Check out the long-running, critically-acclaimed series MORNING GLORIES by Nick Spencer and Joe Eisma, with six volumes available now! In the prestigious Morning Glories Academy, nothing is as its seems and everyone may be an enemy.